Paul Pogba’s agent, Mino Raiola, has taken to Twitter to lash out at Man Utd legend Paul Scholes after he criticised his client at the weekend. It was a miserable time for the Red Devils as they slipped to a 3-2 defeat to Brighton, raising question marks over Jose Mourinho and his side given the nature of the performance. While they will look to put it right when Tottenham visit Old Trafford next Monday night, it appears as though they will have to deal with off-the-field distractions in the meantime. As seen in the tweets below, Raiola seemingly hasn’t taken too kindly to comments made by Scholes over Pogba’s performance at the weekend, just a week after he was appointed captain and put in a stellar display against Leicester City in the season opener. This is highly unlikely to help the situation though as it may well simply add tension around the French international, with Raiola suggesting that Scholes continues to talk to avoid ‘being forgotten’ while jokingly suggesting that the United icon should become sports director and ask to sell Pogba. It comes after Scholes offered his post-match thoughts on the Brighton game, singling out Pogba for criticism over a lack of leadership in midfield and an inability to make the most of Man Utd’s strengths. “There’s lack of leaders in the team, that’s why we thought Paul Pogba might be the ideal candidate to be that leader but he wasn’t there tonight. He had another really poor game. He’s so inconsistent,” he is quoted as saying by the Metro. 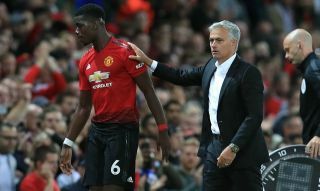 As noted by The Guardian after the win over Leicester, Pogba has himself been sparking talk over his happiness at Old Trafford, and it has led to question marks over his future at Man Utd. Raiola getting involved and potentially souring the relationship with a club legend as well as the club itself, certainly isn’t going to be a welcome step for United fans.